For example, Peru has urban areas, rural areas, deserts, high altitude locations and tropical rainforests, each area carrying its own variety of health risks and requiring different or additional advice. An awareness of the dangers is important especially when poor, or no lifeguards are present and no warning signs or flags. There may be venomous sea creatures present such as snakes, jellyfish and stonefish so local knowledge is important. Enlarge to spot the swimmer and the raft in an unsupervised beach resort! The sea itself is a serious hazard in poorly maintained or unsupervised resorts where there are unpredictable tides or currents. Holidaymakers can be carried out to sea or stranded on sandbanks with a risk of drowning. Foot injuries on and near beaches are common due to sharp litter and broken glass. Seawater may be contaminated by untreated sewage flowing directly into the sea especially during tourist seasons when the population of small towns and villages can increase dramatically. While this is unpleasant, the dilution with the seawater rarely means this causes illness. Hired boats, canoes, water skiing, jet skis, snorkelling, scuba diving and parascending equipment may not always be well maintained with poor training of staff. There may be limited or no rescue services available even in the most popular resorts. 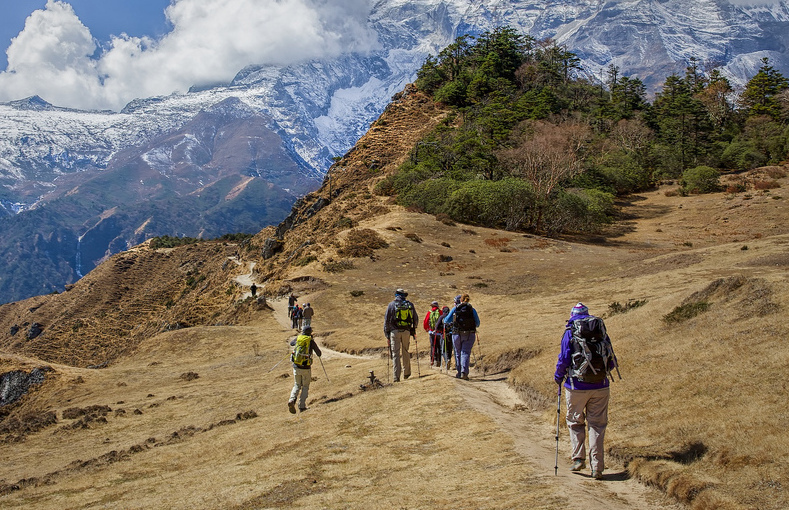 Altitude sickness, exposure to cold and sunburn. 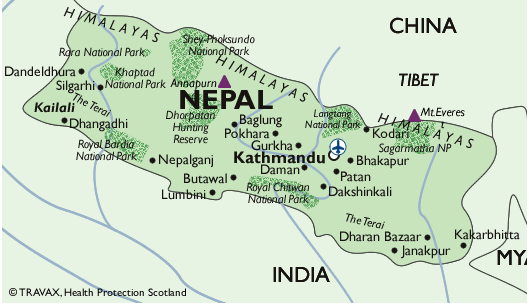 Medical help, if problems occur, may not be easily available in remote parts such as the mountains of Nepal. In rainforests high temperatures and high levels of humidity are common. It is difficult for sweat to evaporate from the skin, making clothing very wet and uncomfortable. While most bird, plants and other animal life in rain forests is harmless, care is needed since the may harbour creatures such as scorpions and spiders. The use of protective boots and thick trousers to protect against venomous snakes is may be necessary. Piranha fish and leeches may be present in lakes, rivers and swamps. Crocodiles and hippopotami are very dangerous if approached especially if they are caring for young. 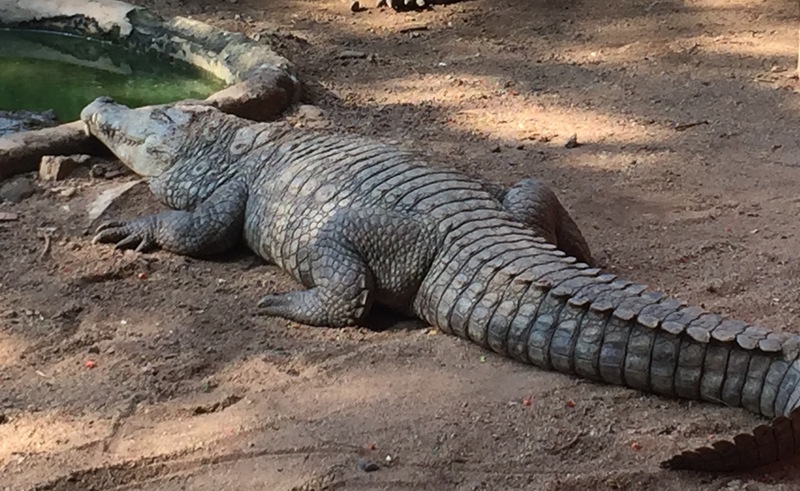 Deaths from attacks by these animals are not uncommon. Local knowledge is essential to help avoid all these risks. 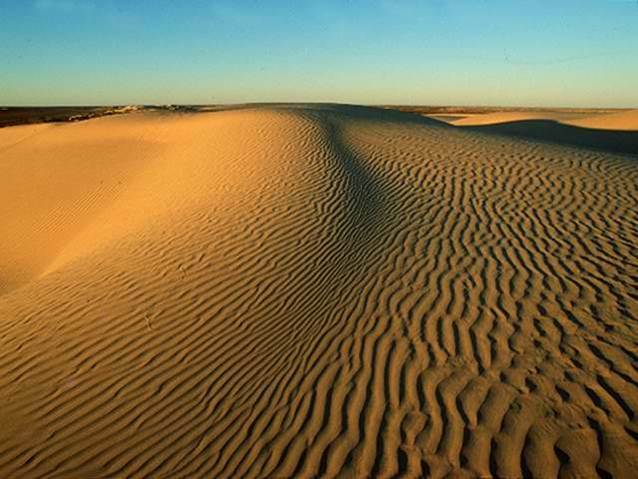 Sandy desert areas lack readily available water although it may be present deep underground or in surface oases. The days are very hot but because of a lack of cloud cover, the temperature drops dramatically during the night even close to freezing. 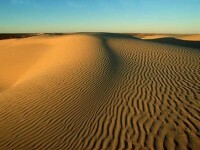 A marked drop in temperature at night also occurs in non-desert areas hot by day that lack vegetation. Protection from the sun and heat, limiting exposure and exercise at the hottest times of day and adequate supplies of drink are important. While easier than even 20 or 30 years ago, electronic communication with the outside world becomes difficult in the absence of a mobile phone signal or internet access unless a radio or satellite phone is carried. However there are exceptions in some popular tourist regions and, for example, it is possible to have a mobile phone signal in game parks in Africa and Everest base camp. Obtaining medical care or evacuation in an emergency from remote areas is difficult and rescue services usually have to be paid for which can be very expensive - up to £2000 per hour for helicopter evacuation is commonplace.